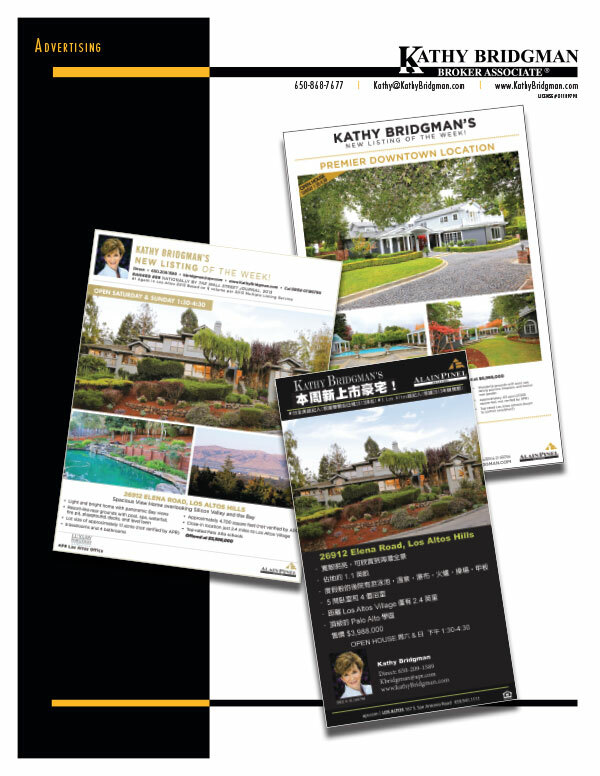 Since 1982, Kathy Bridgman has devoted her energy and full-time professionalism to the Los Altos community, first as a teacher, and now, as a top-producing real estate agent with Alain Pinel Realtors. Holding the distinguished Broker designation puts Kathy in the elite 15% of all Bay Area real estate agents who hold this title. Kathy’s proven marketing skills and insightful knowledge of Los Altos and the surrounding communities has earned her the prestigious distinction of being a member of the Alain Pinel President’s Round Table, which comprises the top 5% of all Alain Pinel agents. 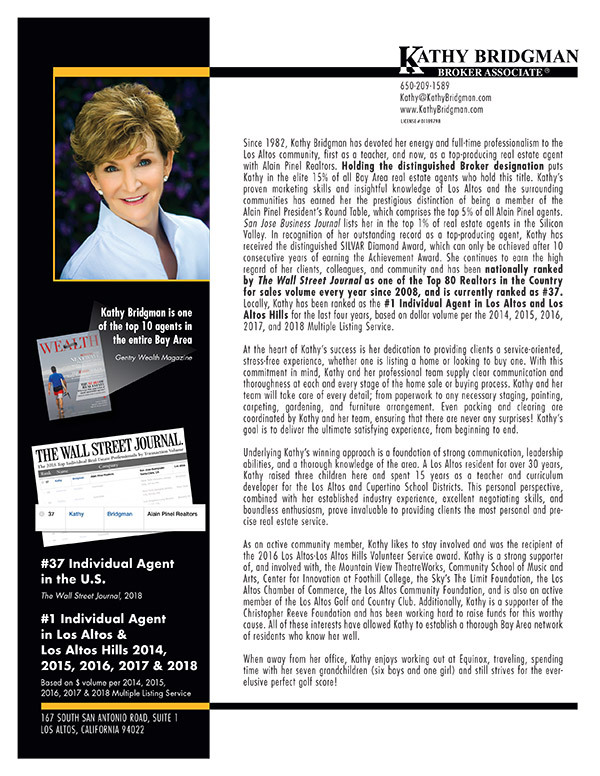 San Jose Business Journal lists her in the top 1% of real estate agents in the Silicon Valley. In recognition of her outstanding record as a top-producing agent, Kathy has received the distinguished SILVAR Diamond Award, which can only be achieved after 10 consecutive years of earning the Achievement Award. 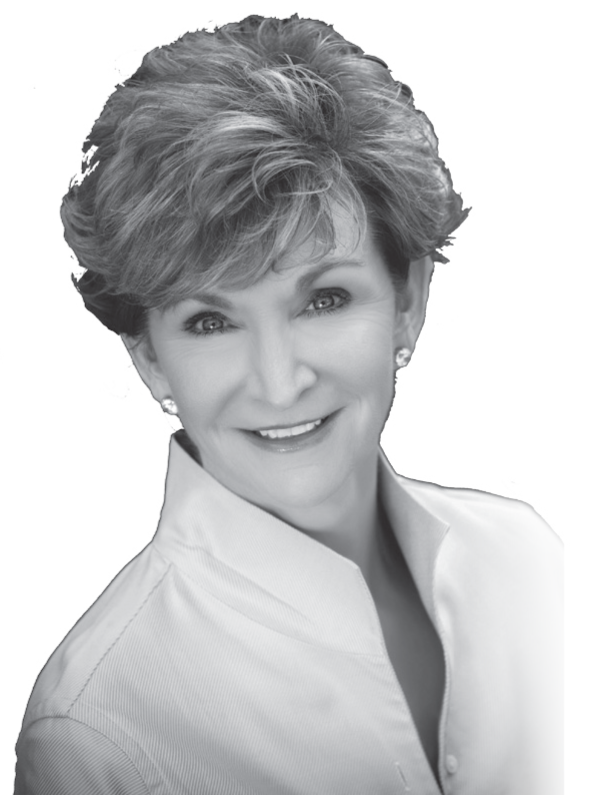 She continues to earn the high regard of her clients, colleagues, and community and has been nationally ranked by The Wall Street Journal as one of the Top 80 Realtors in the Country for sales volume every year since 2008, and is currently ranked as #37. Locally, Kathy has been ranked as the #1 Individual Agent in Los Altos and Los Altos Hills for the last four years, based on dollar volume per the 2016, 2017, and 2018 Multiple Listing Service. At the heart of Kathy’s success is her dedication to providing clients a service-oriented, stress-free experience, whether one is listing a home or looking to buy one. With this commitment in mind, Kathy and her professional team supply clear communication and thoroughness at each and every stage of the home sale or buying process. Kathy and her team will take care of every detail; from paperwork to any necessary staging, painting, carpeting, gardening, and furniture arrangement. Even packing and clearing are coordinated by Kathy and her team, ensuring that there are never any surprises! Kathy’s goal is to deliver the ultimate satisfying experience, from beginning to end. Underlying Kathy’s winning approach is a foundation of strong communication, leadership abilities, and a thorough knowledge of the area. A Los Altos resident for 30 years, Kathy raised three children here and spent 15 years as a teacher and curriculum developer for the Los Altos and Cupertino School Districts. This personal perspective, combined with her established industry experience, excellent negotiating skills, and boundless enthusiasm, prove invaluable to providing clients the most personal and precise real estate service. As an active community member, Kathy likes to stay involved and was the recipient of the 2016 Los Altos-Los Altos Hills Volunteer Service award. Kathy is a strong supporter of, and involved with, the Mountain View TheatreWorks, Community School of Music and Arts, Center for Innovation at Foothill College, the Sky’s The Limit Foundation, the Los Altos Chamber of Commerce, the Los Altos Community Foundation, and is also an active member of the Los Altos Golf and Country Club. Additionally, Kathy is a supporter of the Christopher Reeve Foundation and has been working hard to raise funds for this worthy cause. All of these interests have allowed Kathy to establish a thorough Bay Area network of residents who know her well. When away from her office, Kathy enjoys working out at Equinox, traveling, spending time with her seven grandchildren (six boys and one girl), and still strives for the ever-elusive perfect golf score! At the heart of Kathy’s success is her dedication to providing clients a service-oriented, stress free experience whether one is listing a home or looking to buy one. With this in mind, Kathy and her professional team supply clear communication and thoroughness at each and every stage of the home sale or buying process. Kathy and her team will take care of every detail; from paperwork to any necessary staging, painting, carpeting, gardening and furniture arrangement. Even packing and clearing are coordinated by Kathy and her team ensuring that there are never any surprises! Delivering clients the ultimate proficient experience from beginning to end is Kathy and her team’s ultimate goal. Halin manages all of Kathy’s escrows and property marketing. Coordinating the myriad details of the escrow paperwork is a key function of Halin’s, making sure that all deadlines are met and “all t’s are crossed and i’s are dotted.” This is a critical function to ensure a successful transaction and involves daily interaction with the escrow officers at Title Companies, appraisers, lenders and clients. Having to work with all documents, disclosures and paperwork, plus keep all interested parties informed, Halin’s organizational skills and efficiency keep the process flowing until the escrow is successfully closed. In addition to managing the escrow process, Halin is responsible for the marketing of each property Kathy represents. Her goal is to attain the highest level of visibility possible and to coordinate timely, creative, and well-placed advertising that ensures that the marketing plan she develops is successful. The internet, newspapers, and local magazines are all integral components of Kathy’s marketing strategy. Halin coordinates with a professional marketing agency for brochures and fact sheets, printed ads, and direct mail campaigns. She also supervises the production of virtual tours, organizes Broker’s Tours, and schedules and promotes open houses. She will keep you informed on the marketing of your property and its results. Halin is a licensed Realtor and is available to Kathy’s clients to answer any questions or concerns. Kelly adds a key dimension to Kathy’s winning service-oriented philosophy. Once Kathy and the client decide on the best marketing approach, Kelly works to oversee and coordinate every aspect of the home’s preparation to meet the objectives and goals of Kathy and her clients. Everything – including packing up the home, coordinating any updates such as painting, plumbing or electrical, landscaping, and staging – can be left in the coordinator’s capable hands. A consummate professional and a licensed Realtor, Kelly ensures that each home is ready for the listing date and beautifully presented. "I really do enjoy helping Kathy's clients during a hectic and sometimes very nerve-racking period in one’s life. Moving is not an easy thing to do…but my job is to make it so. Many things need to be done in a very short period of time and my experience with our varied subcontractors allows the client to relax and let me shoulder the burden of a move, allowing a smooth transition for all!" Being born and raised in the Bay area gives Courtney an amazing advantage to assisting Kathy's Buyers on their hunt for the perfect home! 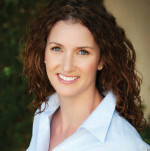 With over 14 years of sales experience, Courtney can assist buyers with confidence, knowledge, and hands-on expertise. She also manages the social media aspect of Kathy's marketing of properties through Facebook, YouTube, Twitter, LinkedIn, Tumblr, Wordpress, Google+, Pinterest, and email campaigns. Her energy, kindness, and experience make her a great asset to Kathy and her team. "Since 2000 I have witnessed my mom become one of the top-producing real estate agents in the Bay Area. The way she deals with her clients is amazing and it's not out of the ordinary for her to maintain these relationships after the transaction is completed. My mom exudes reassuring confidence and knowledge with every single aspect of real estate. Her energy and enthusiasm for her work and her clients is very contagious, making it a joy to do business with her. I am very lucky to work with such an incredible and experienced mentor, who also happens to be my mother!"